In my shorter pieces, including articles and personal essays, I offer a fond look back at the 1950s, drawn from my experiences growing up in Baltimore, Maryland. ﻿College students crammed into phone booths. Couples dancing until they drop. Daredevils swallowing one live goldfish after another. Streakers dashing naked down the street. Planking and flash mobs and robotic pets. These are just some of the crazy fads that have caught hold in the United States over the last century. Where do these ideas come from and why do they catch people's imagination? Fads reflect the mood and spirit of a particular time, and they offer insight into a nation's culture. The 1950s, for example, was a time of economic prosperity and technological development. Americans expressed their delight in new inventions in many creative ways. 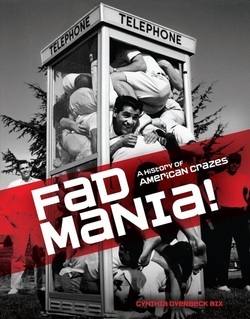 One popular craze on college campuses was to stuff as many people as possible into a phone booth. On one campus, twenty-five people managed to squeeze into a single booth! In earlier decades, marked by the Depression and World War II, dance marathon frenzy caught on. Promoters lured couples with promises of fame and monetary prizes for those who could dance for hundreds, sometimes thousands, of hours. And great ideas never die. Almost one hundred years later, dance marathons came back. One creative variation, the flash mob dance, attracts spontaneous performances that range from flash mob wedding dances to "Gangnam Style" K-Pop flash mobs in cities all over the world.